The practice formerly known as Aton & Riedel has MOVED to the campus of Alton Memorial Hospital, effective June 1! Our new practice name is BJC Medical Group Gastroenterology at Alton to better reflect our proud affiliation with BJC Medical Group which is the multi-specialty physician group of BJC HealthCare. Please note our phone and fax number have changed as well. Our practice specializes in gastroenterology and dedicated to providing excellent patient care in a convenient location. We have extensive experience and are well-respected in the community, and believe that it's important to establish a relationship before you feel sick in order to learn about your health history and help you to establish healthy habits. Gastroenterology physicians treat irritable bowel syndrome, reflux disease, abdominal pain, hemorrhoids and perform colonoscopies, endoscopies, and a variety of other procedures. Dr. Karadaghy’s practice is part of BJC Medical Group of Illinois, a well-established, multi-specialty physician group. 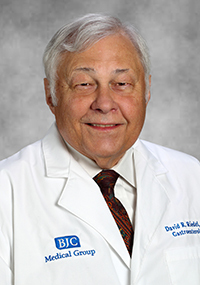 David Riedel, MD, FACG, FACP, chose to practice gastroenterology (GI) because it gives him the ability to prevent cancer by endoscopic removal of precancerous lesions. 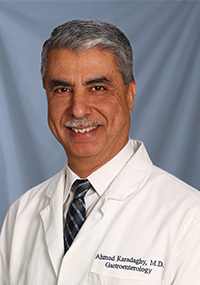 As part of an experienced and established practice, he focuses on general GI issues, including colonoscopy, evaluation of liver and pancreatic disease, gastroesophageal reflux disease, ulcer disease and cancer surveillance. His patients say that he is very informative and very friendly. Dr. Riedel and his wife, a judge in St. Louis County, enjoy traveling to visit their children and grandchildren. He is a member of BJC Medical Group of Illinois, a well-established multi-specialty physician group. "BJC Medical Group" generally refers to both BJC Medical Group of Missouri and BJC Medical Group of Illinois, which are two well-established physician organizations.